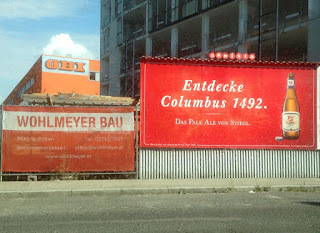 The beer company Stiegl founded in 1492 just launched a massive media campaign to promote its new product, a pale ale named "Columbus 1492". Yesterday on the road every two billboards were covered with their slogan "Entdecke Columbus 1492". "Die Kampagne versucht den Entdeckergeist zu wecken und bringt einen historischen Vergleich mit Christoph Columbus, der 1492, im Gründungsjahr von Stiegl, Amerika für Europa entdeckte." Nobody at Stiegl ever had a history course? A product named after a documented slave trader, and mass murderer? Nobody thought of googling "Columbus 1942" to see just by chance what comes up? The idea of celebrating a "discovery" is at the core of a history that neglects the perspective of those whose colonization and subordination was inaugurated in this event. The campaign has its own hashtag: #stieglcolumbus and can be checked here: http://columbus.stiegl.at Take a photo on what you think about 'Columbus 1492' and use the hashtag.